While Taco Bell is sadly phasing out the much-hyped Naked Chicken Chalupa this month, it looks like the the chain's stunt food laboratory is already unleashing another insane creation. This time, it's a spectacular mashup of two of T-Bell's biggest menu items: the Doritos Locos Taco and the Quesalupa. For real. The beastly hybrid is called the Doritos Quesalupa Crunch and it's made by taking a Nacho Cheese Doritos Locos Taco -- filled with beef, lettuce, and shredded cheddar -- and wrapping it in melted cheese-infused Quesalupa shell, according to a report by Foodbeast. Basically, it sounds like something you'd find on a Taco Bell "secret menu," but it'll hit the actual menu on March 2 at the company's restaurants in Cincinnati and will be around through April 8. There's no word on if or when it'll be available nationwide, unfortunately. But that's not all T-Bell's stunt food maniacs have up their sleeves. The chain is also testing a Chicken Enchilada Burrito that's stuffed with two Rolled Chicken Tacos in Flint, Michigan, and a Caesar Crunchwrap in Nashville, Tennessee. 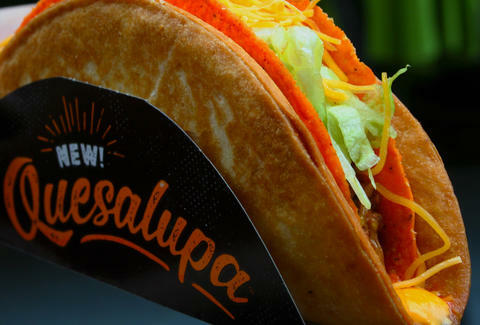 Oh, and as we reported a few weeks ago, Taco Bell is also working on a spicy new version of the Naked Chicken Chalupa, in case you're going to miss the fried chicken tacos when they disappear from menus this month. Again, it's unclear if Taco Bell will introduce the new test menu items nationwide sometime in the near future, but judging by what they look like and sound like, you probably won't have to wait much longer. Tony Merevick is Cities News Editor at Thrillist and needs to rethink his strict new diet now. Send news tips to news@thrillist.com and follow him on Twitter @tonymerevick.